Fiona Bruce is a presenter on the BBC's Ten O'Clock News and BBC One's Crimewatch UK. She also presents the BBC One current affairs programme Real Story. FIona began her career at the BBC in 1989 as a researcher and then as assistant producer on Panorama, covering a variety of ground-breaking stories which took her to locations throughout Europe, the Gulf, Kurdistan and the USA. Prior to her role at the Ten, she presented the Six O'Clock News. 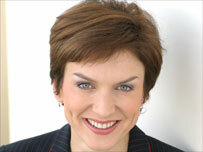 In 2001 she was the first woman presenter to be part of the BBC's election team. In October 2002, George Best spoke frankly to Fiona in his first television interview since his life-saving liver transplant for the BBC ONE programme George Best: Me and My Liver. In December 2002, she travelled to the Ivory Coast to meet Victoria Climbie's parents for a special 4 x 4 programme on BBC One. Fiona has presented The Antiques Show, Newsnight and the weekly current affairs programme Public Eye for BBC TWO, and has reported on the BBC One flagship current affairs programme, Panorama. Prior to this she presented the BBC World Service's daily programme TV Newsday and reported on BBC One's Breakfast News in 1992, before joining BBC South East as a news presenter and reporter for the regional current affairs programme, First Sight. Fiona speaks fluent French and Italian and is a graduate of Oxford University. She was born in April 1964.